F Ben Maxwell (Kootenay, 2003-08) has signed a one-year contract with Spartak Moscow (Russia, KHL). This season, he had eight goals and seven assists in 48 games with Sochi (Russia, KHL). He was an alternate captain. . . .
D Rory Rawlyk (Medicine Hat, Vancouver, Prince Albert, Red Deer, 2000-03) has signed a one-year contract with Memmingen (Germany, Oberliga). This season, he had three goals and 12 assists in 21 games with Brașov (Romania, MOL Liga), one goal and one assist in 14 games with the Florida Everblades (ECHL), and four goals and five assists in 25 games with the Atlanta Gladiators (ECHL). . . .
D Jonathan Harty (Everett, 2004-08) has signed a one-year contract with Székesfehérvár (Hungary, Erste Bank Liga). This season, with Olimpija Ljubljana (Slovenia, Erste Bank Liga), he had five goals and eight assists in 23 games. He also had two goals and 15 assists in 26 games with the Heilbronner Falken (Germany, DEL2). 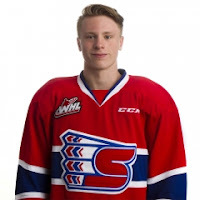 F Jaret Anderson-Dolan of the Spokane Chiefs will be a first-round selection in next month’s NHL draft. He made sure of that by putting up 76 points, including 39 goals, this season as a 17-year-old sophomore. “Jaret hears other players talk smack to him on the ice about his two moms, although it happens less in the WHL because he’s a respected player within the league. “But that’s far from the worst prejudice and discrimination he’s experienced. “When Anderson-Dolan was going through the WHL bantam draft process, some teams told him and his family they would not take him because of his two mothers. As Anderson-Dolan told Horton: “I can’t change people’s opinions. If that’s how they feel about it, I’d honestly rather not be in that organization if they’re going to be like that. I’d rather be in an organization with the Chiefs where they support it completely. Really, WHL? In 2014, three short years ago, there were teams that took the low road on this? There were teams who chose not to draft a highly talented player because he grew up in a household with two moms? Really? The WHL has to be better than this. Perhaps this will make its way on to the agenda for its annual meeting in June. In the meantime, I’m thinking that we haven’t heard the end of this, at least not on social media. There were indications on Twitter last night that a storm is brewing. It turns out there is another bantam draft guide available, this one put together by DraftGeek, which is hooked up with the gang at DUBNetwork. . . . While Western Elite Hockey Prospects, which was mentioned in this space yesterday, has D Kaiden Guhle ranked No. 1, the crew at DraftGeek is going with F Connor McClennon of the Pursuit of Excellence. . . . DraftGeek’s guide, which may be purchased right here, features its top 180 skaters and 25 goaltenders, who are eligible for Thursday’s bantam draft. . . . There also are thumbnails of each of the top 180, a mock first round, a list of the top 10 U.S.-born prospects, and DraftGeek’s top 22 2003-born prospects. The Bakersfield Condors have signed F Chad Butcher and F Evan Polei to AHL contracts for 2017-18. Butcher played out his junior eligibility with the Medicine Hat Tigers, while Polei did the same with the Red Deer Rebels. . . . Butcher, from Kamloops, put up 103 points, including 76 assists, in 68 games this season. In four seasons, he had 259 points, 82 of them goals, in 301 games. . . . Polei, from Wetaskiwin, Alta., had 33 goals and 29 assists in 69 games this season. In 242 career games, he had 131 points, including 72 goals. He actually finished this season with the Condors, getting into one game and recording one minor penalty. . . . The Condors are the AHL affiliate of the NHL’s Edmonton Oilers. Two players off the Kelowna Rockets’ roster are off to the AHL. . . . F Dillon Dube has joined the Stockton Heat, a team whose head coach is Ryan Huska, a former Rockets’ assistant coach and head coach. Dube was a second-round selection by the Calgary Flames, the Heat’s parent club, in the 2016 NHL draft. This season, he had 55 points, 20 of them goals, in 40 games. He missed the start of the WHL season with a knee injury incurred at the Flames’ training camp. . . . Dube’s stay was a short one as the Heat’s season ended last night when it fell 2-1 in OT, on a shorthanded goal, to the San Jose Barracuda. San Jose won the best-of-five series, 3-2. . . . D Lucas Johansen will finish the season with the Hershey Bears, the AHL affiliate of the NHL’s Washington Capitals. He was the 28th overall selection in the NHL’s 2016 draft. This season, he had 41 points, including 35 assists, in 68 games. . . . Dube and Johansen both have signed three-year entry-level NHL contracts. The OHL’s Mississauga Steelheads are scheduled to open the OHL’s championship series on Thursday in Erie, Pa., against the Otters. On Tuesday, Rogers TV shut down channels in Brampton, Mississauga, Richmond Hill and Toronto. This apparently won’t impact the televising of the OHL’s final series — it’s called the Rogers OHL Championship Series — but there are expected to be changes before another regular-season arrives. In Western Canada, Shaw TV announced last week that it was shutting down three stations — in Calgary, Edmonton and Vancouver. That means that the WHL on Shaw, which is in its 13th season, will end its run with the conclusion of this season’s championship series. D Ben Verrall, who played one game with the Prince Albert Raiders in 2013-14, will attend York U in Toronto and play for the Lions. Verrall, from Saskatoon, played the past three seasons with the BCHL’s Cowichan Valley Capitals. He will turn 21 on Aug. 10. . . . In three BCHL seasons, he had eight goals and 21 assists in 132 games. The BCHL’s Alberni Valley Bulldogs have signed Matt Hughes to a two-year contract, with an option for a third season, as general manager and head coach. Hughes had been the head coach of the U-18 Midget Prep team at the Pursuit of Excellence in Kelowna. . . . Hughes also has coaching experience in the AJHL and NAHL, as well as in the BCHL with the Salmon Arm Silverbacks. . . . Hughes takes over from Kevin Willison, who was fired after this season. He had been with the Bulldogs for six seasons. . . . Alberni Valley finished 16-32-7-3 this season and missed the playoffs for the first time since 2012. . . . Evan Hammond, the radio voice of the Bulldogs, has a news release right here.